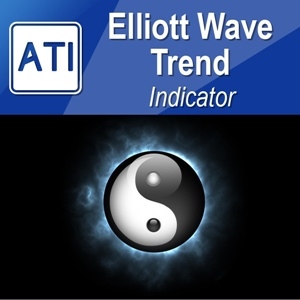 Download Trading Investment Helper for your Winning Trading. We offer free Automatic Installer to help for product installation for all your MetaTrader at once. With our Automatic Product Installer (Trading Investment Helper). help with Automatic installation: Installation takes only few buttons clicks. 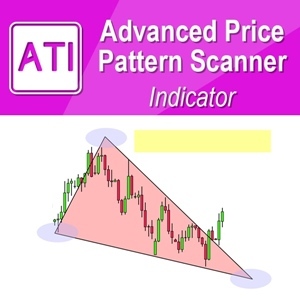 Access to Advanced Technical Indicators and Trading Robots. 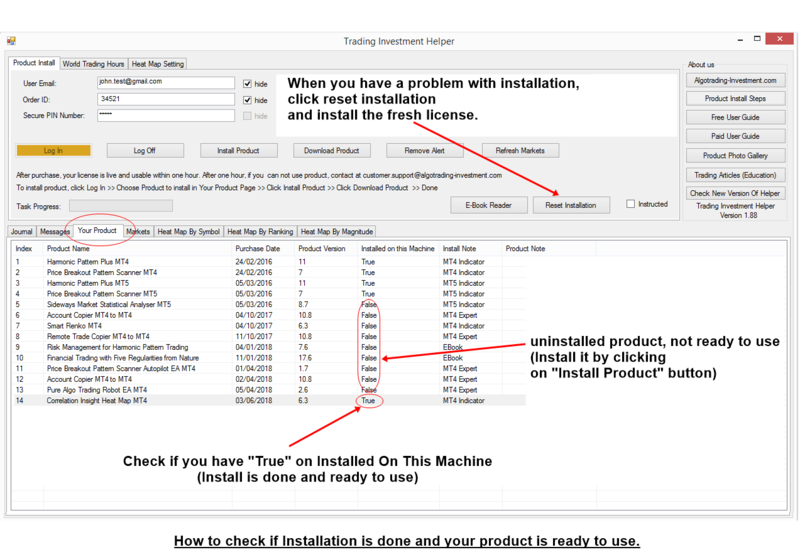 Installation step is extremely simple with the help of the automatic installer (TradingInvestmentHelper.exe). Close all the running MetaTrader terminals in your computer. Run TradingInvestmentHelper.exe as administrator (In the popup menu, select Run as administrator). Enter your Order ID, Email and PIN number in the automatic installer. 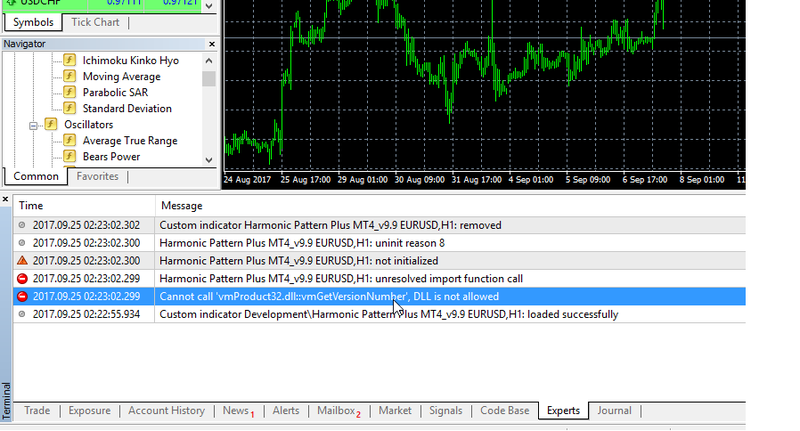 Open MetaTrader and use our products (make sure that you have allowed dll imports for expert advisor setting). If above 8 step installation guide is not sufficient, then please watch this video. 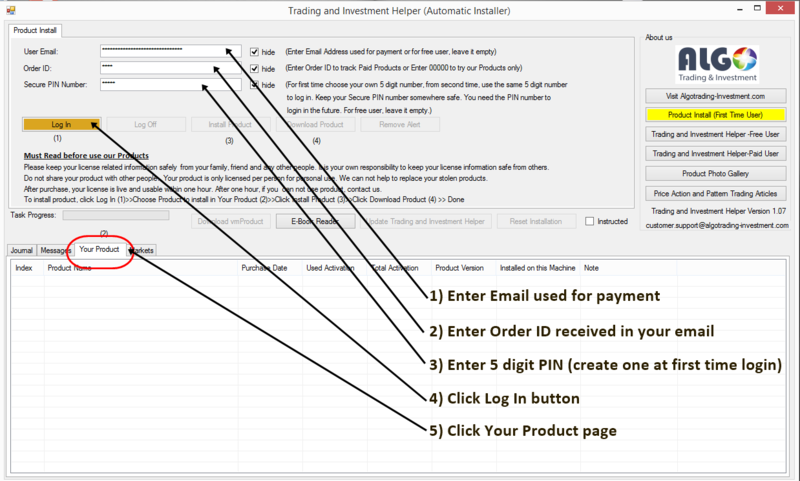 To check your product is ready to use on your computer, please login to Trading Investment Helper. Check if you have “True” on Installed on this machine. Please note that before your license become live and usable, it can take up to one hour after the payment is cleared. If they do not work after one hour, please contact us to check your order with us. 1. Close any MetaTrader 4 or MetaTrader 5 terminals running in your window before starting the Trading and Investment Helper. 3. Please unzip (decompress) the file to start to use it in your Hard Drive. 4. 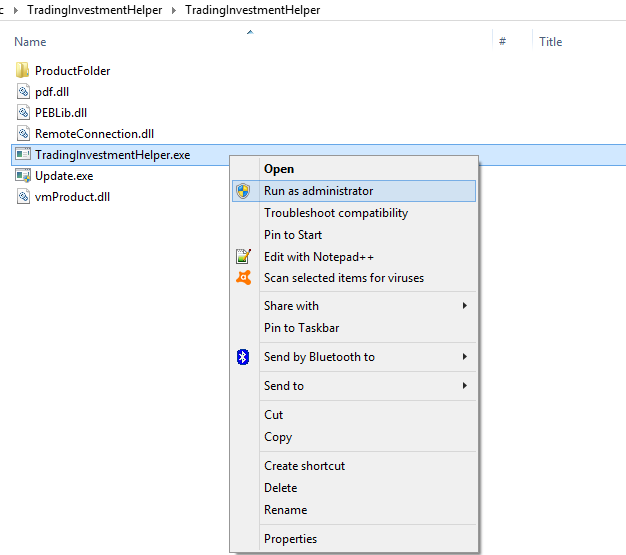 Simply run TradingInvestmentHelper.exe file as administrator from the folder (in the popup menu, select Run as administrator option). 3. Enter PIN number in the entry boxes. For the very first time use, you have to create 5 digit PIN number for yourself. From the second use, you need to use the same PIN number. Please do not get lost your PIN number for future use. 4. 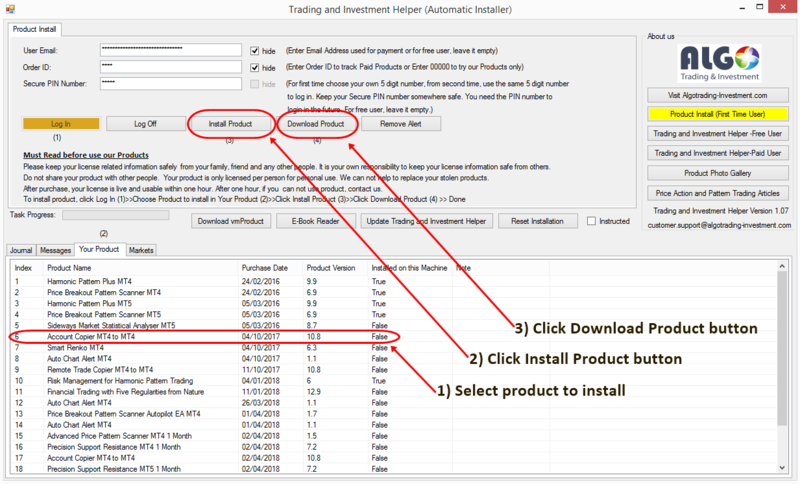 Press “Log In” button in the Trading and Investment Helper. 1. click the product you want to install from “Your Product” page. 3. Press “Download Product” button. 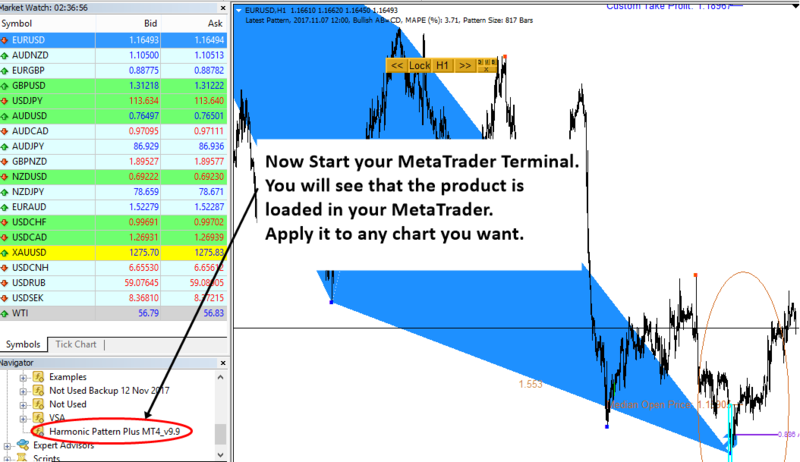 Now start your Meta Trader terminal. Make sure that you allow “dll import” and automated trading from expert option. Then start to use our products. You can close Trading and Investment Helper now. When you have to manually download vmProduct32.dll (or vmProduct64.dll), please use this download link. During installing our product, you might encounter few problems. Here are common problems and solution for the problem. The name of vmProduct32.dll file must not change: Sometimes, users copy the vmProduct.dll file inside Product License Viewer Folder to the Libraries folder in your MetaTrader terminal. This is not the standard installation procedure. The name should be either vmProduct32.dll or vmProduct64.dll. Missing to allow dll import: Make sure that dll allow option is ticked in the Expert Advisor tab (Tools>>Options>>Expert Advisors) as well as the Common tab (Navigator >> Attach to Chart >> Common) when you attach the indicator to your chart. It is really a simple thing but many users miss this step. When vmProduct32.dll or vmProduct64.dll files are not copied to your Library Folder for some reason: When you do not have vmProduct32.dll for MT4 or vmProduct64.dll for MT5, you can simply copy and paste the either vmProduct32.dll or vmProduct64.dll file into your library folder of your MetaTrader. You are using Buddhist Calendar for your Window OS: Sometimes, users can use Buddhist Calendar. In the Buddhist Calendar, the year 2018 is showing like the year 2561. The Buddhist Calendar has the 543 year difference from the other normal Calendar like US, UK or FR, etc. 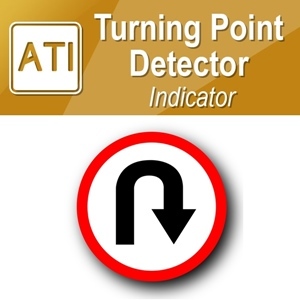 This can stop Trading Investment Helper. The simple solution is to change the time format in your Window OS to the normal calendar. Even the Thailand time format has the choice for the normal calendar equivalent to US, UK or FR timeformat. Anti-virus software or firewall is blocking the Trading Investment Helper: For the remedy for this problem, you have to make the Trading Investment Helper to be exclusive from your anti-virus software or firewall. Here is the example link showing how the Avast Anti-Virus software can exclude specific folder or files (https://www.avast.com/en-gb/faq.php?article=AVKB168). If you are using Window Defender, then visit this link to stop Window Defender temporarily (https://algotradinginvestment.wordpress.com/2018/06/21/disable-window-defender-temporarily/). 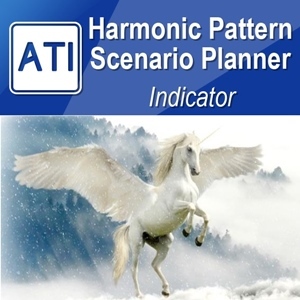 Trading Investment Helper use Dot Net Framework 4.0. Various window OS have different Dot Net Framework, sometimes this can be the only issue when Trading Investment Helper can not run in your computer. 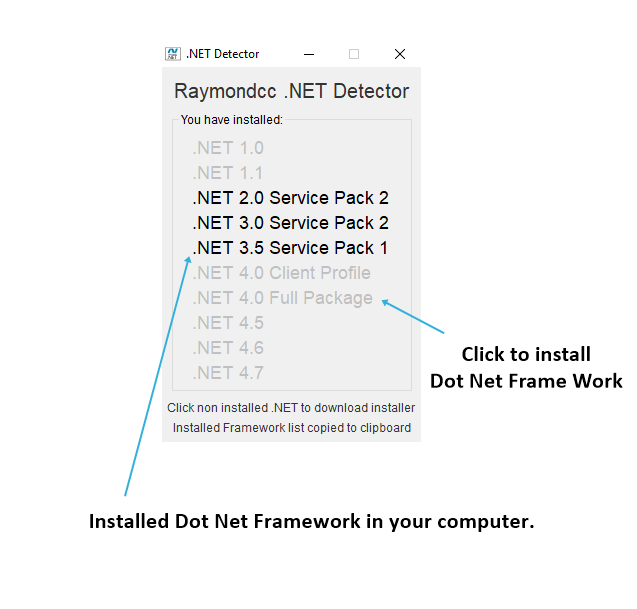 To know which Dot Net Framework is installed in your computer, you can simply use this tool, please download this Dot Net Detector. Extract them in your hard drive. There is no need for install anything since this is portable version. Just run the exe file and you will see the Dot Net Framework version in your computer. You can simply install the Dot Net Framework by clicking on the form. Please try to install Dot Net Frame work version 4.0 Full package.